For the first time ever, the FSB will make public secret documents regarding counter-intelligence activities from its creation to the present. Documents revealing the Service’s history with all its heroic and tragic pages will be on show in an exhibition dedicated to the 90th anniversary of the counter intelligence service at the Central Museum of the Army in Moscow starting December 4th. A copy of a document signed in 1970 by then chairman of the KGB Yury Andropov, about operation “Archive” is on display. Documents also reveal how, near Magdeburg, Soviet soldiers exhumed Hitler's remains, burnt them, and threw the ashes in the river. Documents revealing the German attempts on Stalin’s life can be found here as well. Fascists recruited former Soviet citizen Pyotr Tavrin to kill the Soviet dictator. A fabricated note appeared in a Soviet newspaper which reported Tavrin had been awarded the Hero of the Soviet Union. Even the golden order in the shape of a star found on the saboteur’s chest was genuine. Later it was found out that it had been stolen from Major-General Ivan Shepetov, who had been executed in a concentration camp. The Germans miscalculated only one thing – the medal was pinned to the uniform in the wrong place. A major section of the exhibit is dedicated to documents from the World War II era and the work of the counter intelligence service did at that time against spies. The documents presented at the exhibition tell about the activity of military counterspies in German intelligence schools. Here one can read secret orders on which state objects should be blown up in Moscow in case of German occupation of the capital. Unique German objects are also on display, including the gun used to shoot Goebbels and his wife and Hitler's party service jacket. Two sections of the exposition are devoted to Stalin’s Great Purge, in which six former chiefs of the Soviet counter intelligence service were shot. Propagandist posters with Soviet slogans cover the walls of exhibition halls. 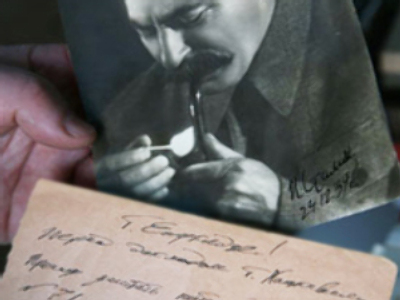 Visitors will get a chance to see documents signed by Joseph Stalin, Lavrenty Beriya and Felix Dzerzhinsky. Their personal belongings will also be on display. Visitors will get a chance to learn about the activities of the All-Russian extreme committee, the body which existed from 1917 to 1922 for the struggle against counterrevolution and sabotage headed by Felix Dzerzhinsky. For the first time the sculptural portrait of “Iron Felix” will be shown to the public. Newspapers of the time tell about methods used by foreign special services’ to recruit Soviet officials. For example the Krasnaya Zvezda Daily (the Soviet Army newspaper of the time) calls certain politicians and statesmen of the Soviet era “bloody dogs” “mad dogs” “footmen of fascism”, “contemptible vipers” and calls for them to be shot. Documents revealing the search for military criminals and traitors, including the search for the burial places of Adolph Hitler and Joseph Goebbels are also shown. All exhibits and documentary materials are provided by the counter intelligence service, the Management of Registration and Archival Funds of the FSB, the FSB Academy, the Central Museum of the Army as well as by veterans of the World War Two, former intelligence agents, and private collectors. Ssshhh! Guess who's 90 today!